Switch heater installation will continue (and hopefully finish) this weekend, resulting in 30 minute headways from 10pm Friday through the close of business Sunday. 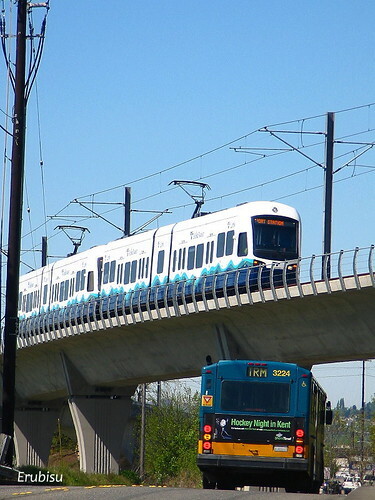 Link will be operating single-track from between Columbia City and Stadium, so riders will be directed to one platform. This resumes the work that began at the end of April. By taking a three-week break, Sound Transit avoided the entire Mariners and Sounders homestands, where weekend ridership is a bit higher. The switch heaters are supposed to weatherproof the system in the event of another Snowpocalypse. We got a little lucky in that El Niño prevented any serious weather this winter. Could someone explain the mechanical reasons why Link can’t do night owl service (at least between Stadium and Airport Stations)? It’s time for the transportation industry to look after the transportation needs of its own employees. It comes down to cost for what little ridership there would be at that time of night and not enough vehicles to maintain a proper maintenance schedule to protect in the event of a vehicle failure while over the road. I would agree that a night shadow bus would be the best solution as the system gains riders but as it is, is it really worth to run a 40 foot coach for 4 hours for maybe a maximum of 30 people? Actually I think it mostly comes down to the costs associate with keeping the tunnel open. ST doesn’t want to pay to keep it open for the trains. This is why *completely* agree that link shadow service should be operated all night using buses, at least on friday and saturday nights. Service should operate along the whole line going from station to station. Could service on Friday and Saturday nights be extended to 2 or 2:30, with all night service on a new “87” every night? Regarding the buses shadowing the rail line: this actually happens in Berlin. The buses run on the surface between 12am and 4am, with about 7 buses running between those times. Couldn’t they use one of the cutaway vans or something similar? That would be the best thing they could do. Those new workhouse vans would be best. It doesn’t have to be all new service. It can be a slightly-rerouted extension of the #7 graveyard runs. If it can coordinate a hookup point with the 124 night owl runs, it doesn’t even have to be a one-seat ride to the airport (as long as the two buses are next to each other, letting passengers transfer between the buses). Nor is it adding just 30 passenger trips to the system. Their ability to catch Link home adds a total of 60 trips to the system. I suspect it’s actually more than that, but there’s no way to know without trying it for a while. If the 40-foot bus is too big, borrow an Access van. Cancel the 38 (which seems to carry fewer than 30 passengers all day on its 1-bus back-and-forth route between Beacon Hill and Mt Baker Station) as a place to find the revenue. Better yet, cancel the useless 42. One organization shouldn’t be able to dictate Metro’s routes during lean times like this, especially one that’s completely redundant to Link and the 8. The 38 may be not well utilized, but it does offer service on a steep hill that some patrons can’t easily make it up or down to get to Link. Unfortunately, deleting the 42 and 38 would look like disregarding the community’s preferences and ramming changes down their throats — bad news for politicians hoping to be reelected and bureaucracies trying to survive in this anti-tax climate. In the end we either have to convince the 42 supporters to love Link, or more easily, show that they are not speaking for the majority of residents in Rainier Valley. I heard a partial recording of the announcement of service interruption coming Friday when I was at Westlake yesterday afternoon. It was interrupted mid-sentence by “The next train southbound…”, then continued on the original message, garbling the whole announcement. I do much appreciate the verbal warnings. There must be a cheap way to do temporary signs. There should be signs. Someone on my bus thought the message said the tunnel would be closed for the weekend! Yup, message sounds about the same to me too…. Look for stick-on signs on Link train windows, announcing the weekend service disruption.